Click the “Sign In” button in the upper right hand corner of this screen. Click the “Create New Account” link below the "Sign In" button. Fill in all the information about the Head of Your Household (Not your children at this point). Only the fields marked with an asterisk are required! For "Municipality" please select the city you live in. Another window will pop up with your family profile information all filled in. Now you can add a spouse or children. To add a spouse or child, click “Add Member” and fill in the blanks for your children or spouse. Click the “Save changes” button. You now have your Family Profile completed. You can now register for courses. To register for a course, select a category from the green menu bar. Browse for courses according to the sub-categories. Once you have selected a course, click the blue “Register” button. Select the family member that is registering for the course, and hit “Next”. A waiver for the course will appear. 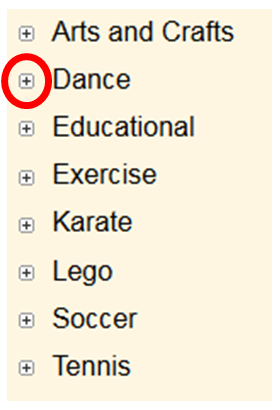 A parent should sign the waiver by tying his or her name in the field that says “name”, then hit the “I agree” button. A screen will pop up confirming what you have done. Hit the “Finish” button. Your Cart window will now appear listing all the courses you have signed up for in this session. If you want to sign up for more courses, go back to “Home” and repeat steps 10 - 14. If you are done shopping and ready to check out, hit the “Check Out” button. Follow the prompts to pay for your courses using your credit card. At the end of the process, print your receipt. You are now registered. There are several ways to locate the class you want to register for. Select a class by entering in the 7 digit course number located in the brochure and clicking on the green search button. 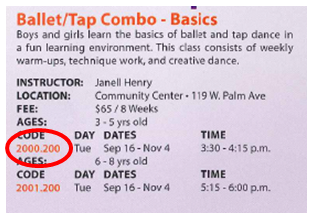 or register for the class by clicking on the button.